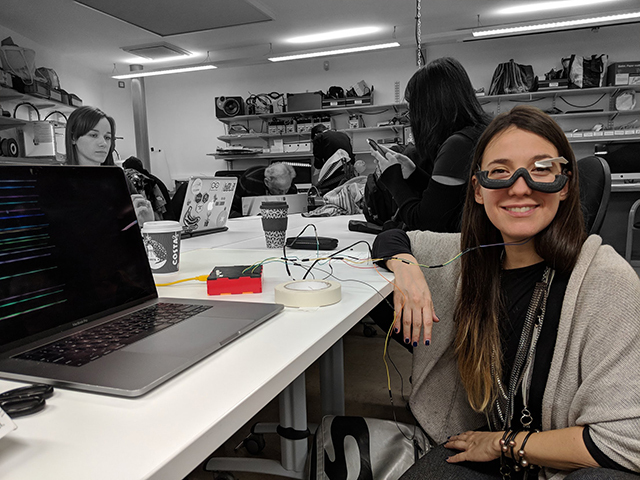 “Fascinating Face” is a project exploring how our facial expressions can be sensed by the physical computing system, and then react to affecting the visual and audio narratives in which we are experiencing. Though the experience of having the audience subtle facial movements read by and reacted by the computing system, and further to generate/control the computing visual and audio materials, audience would raise awareness of their facial movements, and have better understandings of the meaning of their facial expression. Comparing with other body parts' movements, the facial movements are so subtle, so tiny - yet so intimate with our emotion, or saying, our psychological sense. Inspired from my experience of anxious insomnia - holding a tension between 'forcing my mind to keep awake to think' and 'bodily falling sleepy', I found that the eyelid movement played an important role in sensing and reacting to this tension. And the affect between our physical facial movement and our psychological sense is bidirectional. So I developed this two-mode system to encourage the audience to think about the relation between face expression and emotional communication. To experience this system, you would need to wear the glasses-like device on your face, and stick a piece of the “detecting paper” on your eyelid (like massive eyelashes). 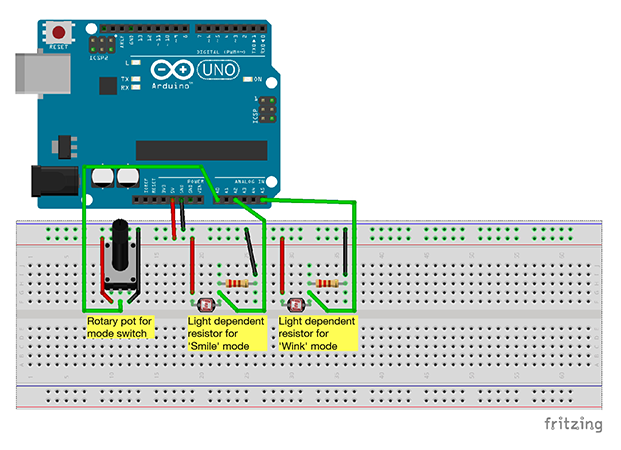 The the sensor (light sensitive resistors) in the device would detect the light value changing while you closing your eyes and the “detecting paper” getting down to cover more light to the sensor. So if you do a wink, the displayed visual animation and the playing audio would be affected - In visual, particles were running straight properly, but they would lose their ways when you wink. In audio, the beautiful song would be sung in a drunk tone when you wink. To experience this system, you would need to wear the cheekbone device on your face. When you smile, your cheekbones will raise the device, then the sensor (light sensitive resistors) in the device would detect the light value changing as the gap between the sensor and your chin is getting bigger. And the displayed visual animation would be affected. So when you have a poker face, the sea would be quiet and calm; when you do a smile, the sea would get more exciting. See all the process documentation here. This interactive system could be an installation in gallery space, like meditation experience. It also could be a visual/audio controller for performance occasion.